Roll those bones! Gothic pirate themed Skull Dice with Death. 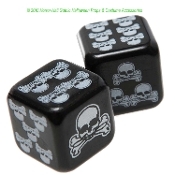 Funky black and white skull and crossbones printed novelty devil poker dice is a fun addition to any gothic or pirate inspired game. Halloween treats, punk gambler cosplay costume accessories, poker game prizes, bachelor gifts or birthday party favors. The dots have been replaced with skull and crossbones images on a black base. Shake for shots, or try replacing a pair of regular dice to add a dark demonic twist to an everyday board game. Argggggh, fun party supplies for mateys of all ages! Don't sail the seven seas without the right pirate or gothic themed party games, favors, and gifts. Entertain your little buccaneers with Pirate Skull Dice. Skull and cross bones dice is a great addition to any pirate inspired adventure game for any buccaneer themed birthday party, or just for rainy days! One pair of skull decorated dice per package. Standard dice, with smooth rounded edges. Each rolls 1-6 skulls, instead of dots. Each die approx 3/4-inch (1.88cm) each in diameter. -Pair of pirate dice in each package. -Warning: Choking Hazard. Not recommended for children under 3 years.